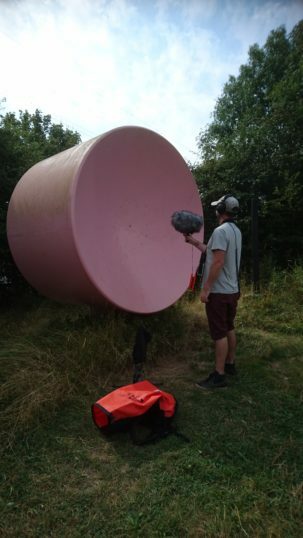 I was heading down to Wat Tyler Country Park in Pitsea to take part in a reccie for an Estuary Festival project and remembered that there were two sound mirrors, or sound marshmallows as they’re called here. I commandeered my friend Alan Hockett to walk to the other (furthest) mirror and see if I could record a conversation between us. The mirrors worked pretty well, but it takes a bit of experimenting to find the ‘sweet spot’, a point where the parabolic shape of the curve reflects the sound back to. I don’t think the recording does it justice here as the sound is clearer in reality. Go and try them for yourself.